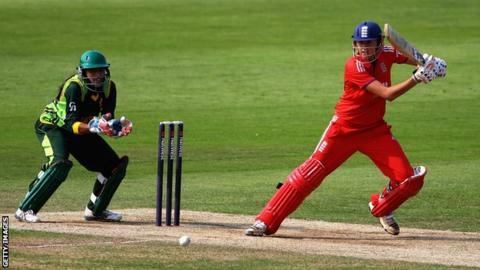 England all-rounder Jenny Gunn says the home side have "a point to prove" when the women's Ashes series against Australia begins on Sunday. The Ashes will be decided over all three formats of the game, with holders Australia entering the contest as one-day and Twenty20 world champions. "They are in the same position as we were in 2009," Gunn told BBC Sport. "The Aussies came hard at us and that's what we're planning to do to them. We have a point to prove." England - then ODI and T20 world-title holders - retained the Ashes when Australia last toured four years ago. Since then, however, the Southern Stars claimed Ashes victory down under in 2011, beat England in the World Twenty20 final of 2012 and won the World Cup in February. Australia beat England by two runs en route to their World Cup success in India. That disappointment for Charlotte Edwards' side came after a one-wicket loss to minnows Sri Lanka, defeats that ultimately ended their title defence. "We weren't that far away in India," continued 27-year-old Gunn. "We didn't turn into a bad team. There were just some key moments that didn't go our way." Coach Mark Lane stepped down after the World Cup, to be replaced by Paul Shaw, who filled the new role of head of performance. And batter Lydia Greenway says training under Shaw has been focused on eradicating the mistakes that cost England at key moments in India. "In training we've been putting ourselves under more pressure, trying to simulate the game situation," said the Kent left-hander. "If you're as familiar as possible with the potential situation then you will be better prepared." England's bid to retain the Ashes will, for the first time, be spread over a single four-day Test match, three one-day internationals and three Twenty20s. Six points will be awarded to the winners of the Test, which begins at Wormsley on Sunday, with two points apiece if the match is drawn. Two points will then be on offer to the winners of the limited-overs games. "To contest the Ashes over all three formats makes it even more exciting," added 28-year-old Greenway. "We're not the ODI world champions, we're not the T20 world champions and the Aussies hold the Ashes. We want to try to get them back and that's what international cricket is all about." However, with England and Australia the only women's teams currently playing Test cricket, Gunn rejected any suggestion that the new Ashes format indicates the beginning of the end for the longest form of the game. "Test cricket will continue because of the history of Test cricket and the Ashes - those two sides will always play," she said. "Hopefully other teams will come on board but, as long as England and Australia play, we're happy."